The router is the component in charge of translating each incoming HTTP request to an Action. the HTTP method (e.g. GET, POST, …). conf/routes is the configuration file used by the router. This file lists all of the routes needed by the application. Each route consists of an HTTP method and URI pattern, both associated with a call to an Action generator. Each route starts with the HTTP method, followed by the URI pattern. The last element is the call definition. You can also add comments to the route file, with the # character. The HTTP method can be any of the valid methods supported by HTTP (GET, POST, PUT, DELETE, HEAD). The URI pattern defines the route’s request path. Parts of the request path can be dynamic. Note that a URI pattern may have more than one dynamic part. The default matching strategy for a dynamic part is defined by the regular expression [^/]+, meaning that any dynamic part defined as :id will match exactly one URI part. Here for a request like GET /files/images/logo.png, the name dynamic part will capture the images/logo.png value. The last part of a route definition is the call. This part must define a valid call to a method returning a play.api.mvc.Action value, which will typically be a controller action method. If the action method defines some parameters, all these parameter values will be searched for in the request URI, either extracted from the URI path itself, or from the query string. # Extract the page parameter from the path. # Extract the page parameter from the query string. Many routes can match the same request. If there is a conflict, the first route (in declaration order) is used. The router can also be used to generate a URL from within a Scala call. This makes it possible to centralize all your URI patterns in a single configuration file, so you can be more confident when refactoring your application. For each controller used in the routes file, the router will generate a ‘reverse controller’ in the routes package, having the same action methods, with the same signature, but returning a play.api.mvc.Call instead of a play.api.mvc.Action. 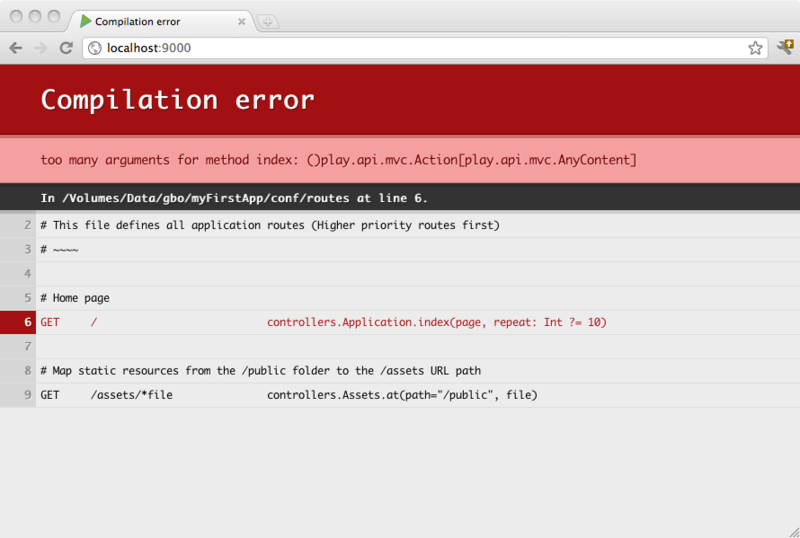 The play.api.mvc.Call defines an HTTP call, and provides both the HTTP method and the URI.